I can't think of anything more adorable than a teeny-tiny little table, or a tiny little roll of paper towels, or anything else that falls into that teeny-tiny little category. Not sure why I find these teeny-tiny things so incredibly amazing, but to see something shrunk down to Lilliputian size truly does fill my heart with joy! Admittedly, this great big obsession of mine with all things miniature didn't just happen overnight. It actually started when I was five years old and Santa brought me my first doll house. 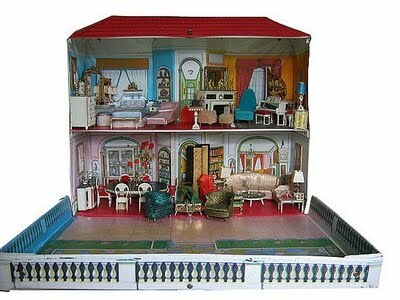 Granted, it was only made of plastic and not near as fancy-shmancy as the doll houses I'm into now, but it was the most glorious mansion on the planet in my little world. And while that doll house is long gone now, it is certainly not forgotten and will always hold a very special place in my heart for introducing me to my lifetime obsession with all things teeny-tiny. Over the past several years, I've had the opportunity to indulge in my fascination with miniatures by investing in several doll houses...two of them pre-built, one of them vintage, all of them in need of finishing and lights. In my search to find instructions, techniques, furniture and supplies, I have run across many inspirational ideas and many wonderful people, all of whom seem to be as teeny-tiny obsessed as I am. As a result, I have decided to put together this blog so I can share with like-minded individuals who might have a similar infatuation with all-things miniature. My goal with this blog is to dedicate at least three hours a week to work on my doll house projects, and as I do, I plan to post photos of my progress and discuss. Along the way, I will introduce works by miniature artists I admire, discuss finishing products and materials, and share ideas I find interesting. If you want to keep track of the latest, make sure to follow Lah-Di-Doll-Blog! Thank you for visiting, and hope to see you again, real soon!